Rwanda’s international recognition is often defined by the horrific 1994 genocide, but to many of the country’s citizens, the its story should not begin or end there. 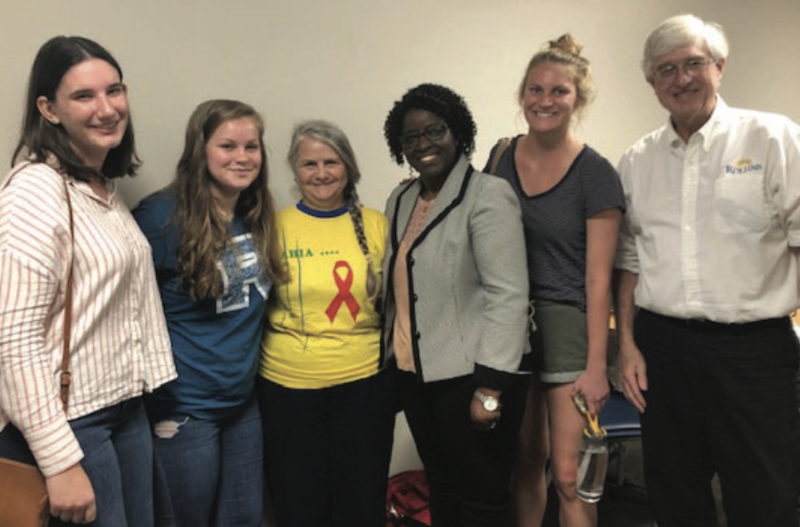 Ebralie Mwizerwa, a survivor of the Rwandan Genocide, relayed Rwanda’s story of tragedy, strength, and regrowth to a packed classroom of students, faculty, and staff. “Rwanda has risen from ashes. From the genocide, we completely lost the country. But thank God for the leaders who could rebuild and understand and for the Rwandans who could be so resilient to rebuild again. Its narrative has to be continued and known by the world,” said Mwizerwa. The genocide began in April 1994 during the Rwandan Civil War, following ethnic tensions between the Hutu ethnic majority and the Tutsi minority. The Hutu nationalists initiated the mass killings and called for local citizens to engage in the violence against their neighbors, the Tutsis. As a result of this genocide, more than 2 million Rwandans fled the country and nearly 1 million were killed. Mwizerwa hid for weeks with her children, emerging at the end of the 100-day genocide in July 1994 to step over piles of dead bodies, which included members of her extended family. This traumatic experience has become integral to her life and career, which she now uses to share her story and promote peace. Mwizerwa and her family came to the United States as refugees and found the opportunity to mend the broken spirits of other refugees. She and her husband co-founded Legacy Mission Village in 2000, a non-profit that helps refugees adjust to their new homes and become active and productive members of their community. Today, she lives in Tennessee and works as the Project Coordinator for the Outreach Foundation, which is a religious charity that hosts missions to provide aid to those in need across the globe. As a survivor herself, Mwizerwa has used the tool of forgiveness to move on and continue to be strong for her family and herself. She said that the wounds are still sometimes fresh for survivors, but forgiveness has al- lowed her to no longer be a prisoner of the past. Instead, she has become a champion for the future through her work with the Outreach Foundation. how much we faced death. I cannot tell you how much we were saved by the Hand that protected us,” said Mwizerwa. The turning point of her path toward forgiveness began in 2011 when she and her husband accompanied a mission team to Rwanda. There, she encountered some of the Hutus who had killed her loved ones. In this situation, Mwizerwa explained that there were two options: revenge or forgiveness. “The one [thing] we can do is to go to them, acknowledge that we know their mistake, and stand our ground of peace. Peacemaking has never been an easy situation,” said Mwizerwa. However, Mwizerwa and her husband took their forgive- ness one step further by performing an act of servanthood. “We took a basin and washed their feet as a sign to them [that] this is it. We are putting this down. We wash it away, and we are your servants,” said Mwizerwa. She did this to prove to the Hutus that she forgave them. Before this, the Hutus were hostile and aggressive because they thought Mwizerwa and her husband were coming for revenge. However, with forgiveness does not come forgetfulness. Mwizerwa has still retained the memories of those she lost: her neighbors, uncles, cousins, and mother-in-law. “Today the battle is how should we move on and how should we forgive. People are still stuck in 1994… because of the many things that came their way,” said Mwizerwa. Rwanda has started rebuilding itself from the ground up through convicting those responsible for organizing the genocide, growing their economy out of poverty, and uniting with one another through pride for their country. The event was hosted by the Africa & African-American Studies Program and facilitated by Dr. J. Scott Hewitt, associate professor and director of teacher education. Hewitt is also the faculty leader for the Rollins field study that travels to Rwanda every other year.